UNISON is by far the largest union representing Nursery Nurses in Scotland. Nursery Nurses are the largest single professional group delivering education to Scotland's children - we want their pay and conditions to reflect the importance of the job they do. 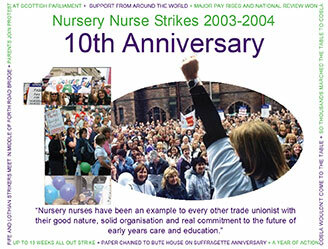 27 May 2014: It is 10 years since nursery nurses in Scotland returned to work after a year- long dispute culminating in up to 13 weeks of all out strike. It was the longest strike in Scotland since the miners’ strike. It may not be surprising for a women dominated profession that nursery nurse pay had not been reviewed for 15 years and they had been waiting 18 months for a response on their claim. They had mounted demonstrations, submitted a 20,000 signature petition to the Scottish Parliament and lobbied parents, councillors and MSPs. With no progress their patience ran out and they balloted for action. In a 64% return over 90% voted to take strike action and action short of strike action. 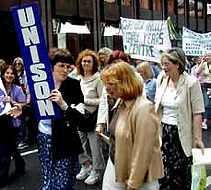 Strikes began on 20 May 2003 in Glasgow and the West and were then co-ordinated across Scotland in a rolling programme to seek a national settlement that would address the pitifully low pay and low value councils afforded these workers. But more than that, it was also about dedication to the children they served and a real commitment to the future of early years care and education delivered by properly trained and supported professionals. In 2004, the action culminated in all-out strikes with some of the most imaginative events ever seen in a dispute to keep the fight in the public eye. Glasgow held a candle light demonstration at the City Chambers and lobbied the First Minister at the SECC. There were huge rallies in Dundee, Ayr, Glasgow and Edinburgh. Fife held a ‘fancy hat’ march to Pittencrieff Park. Nursery nurses got into the audience of the BBC’s Question Time in St Andrews. Strikers from Fife and the Lothians marched to cross borders and meet in the middle of the Forth Road Bridge to show the absurdity of CoSLA’s insistence on local deals instead of a national settlement. On the 90th anniversary of Ethel Moorhead’s force-feeding in Calton jail, nursery nurses dressed as suffragettes paper-chained themselves to the First Minister’s residence. And the one I love most. When CoSLA refused to come to the table for national negotiations, thousands of nursery nurses and supporters marched through Edinburgh carrying the table to CoSLA and setting it up outside the organisation’s front door. And when the media attacked them, the nursery nurses turned up at the door of the Evening News and demanded the journalists account for themselves! We should maybe do more of that! But gradually branches started to settle locally and eventually the strike committee had to give the go ahead for local settlements. Among the last to settle were Glasgow, Edinburgh and Renfrewshire with all branches signing deals by 4 June 2004. Around the country the strike delivered thousands of pounds in new gradings and nationally it also delivered a Scottish Government review of early years. The action changed the face of early years work and the importance of the role of nursery nurses across Scotland. Just after thousands of nursery nurses returned to work after year-long industrial action, they heard that they had won a national Early Years Review that would focus on the workforce, qualifications and, crucially, pay and conditions. 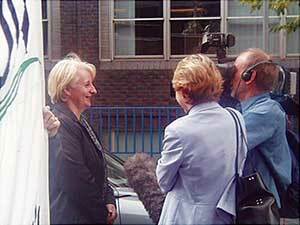 UNISON's Carol Ball has been appointed to the Steering Group. See also details of the review, including minutes and reports, at www.scotland.gov.uk/Topics/People/Young-People/Early-Education-Child-Care/EarlyYearsReview/intro.